Here is why I like my trusty ANC Halfords 10 Speed bike. From a technology point of view this bike bought in 1984 had a bunch of new features that made it cutting edge at the time. Lugless tube welding that gives clean smooth joints where the frame tubes meet. Cotterless Crank mechanism locking pedals to crank. Small mudguards that have the remains of the London to Brighton stickers from back when I used to do that event. Aztec control blocks special compound break blocks angled slightly to the rim giving great breaking in wet and dry. Good times and is still in use today (see Fitness challange entry). Have had to replace the cog block and a couple of wheels along the way but this bike has been best value for transport money. 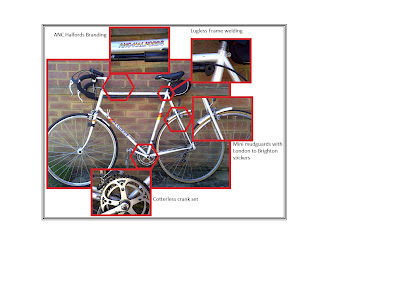 Finally a picture of the original ANC Halfords bike upon which this bike was based. Just for the pedants out there - yes this used to be a 12 speed bike originally but I had to replace the gear block and could only find 5 speeds that fitted.